Collect 5 new items each from world 1 and world 2 to upgrade your Bomb to a Mega Bomb and your Whip to a Boomerang. Most can be done in infantile mode except for 1 item. Items will need to be collected in order as well. This can be done only in normal mode. You need to complete the race in the three zones for each world and earn the gold reward. Talk to the Racing NPC at the start of each zone to proceed. This set of achievements was introduced with the 2018 release of the Super Adventure Box. Drooburt can be found in the Rata Sum Jail. 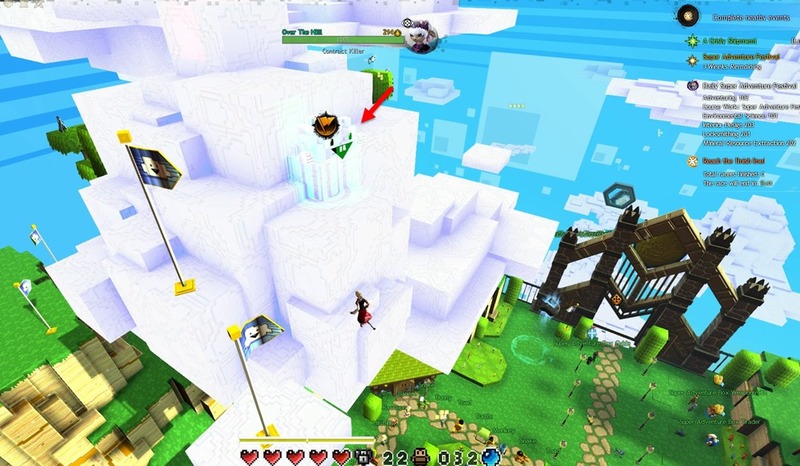 To get into the jail, just slide or griffon down one of the sides of the Rata Sum cube and when you get under the cube, you will be teleported to the jail. You need to donate 100 Continue Coins for the achievement which can be repeated 5 times for 25 AP (500 Continue Coins). 10 baubles = 1 continue coin so you will need 1000 baubles per 5 AP or 5000 in total. You will need to complete the Course Work: Super Adventure Festival achievement (which requires you to complete 3 of the daily Super Adventure Box achievements) 8 times for each completion of Course Load. This will require 8 days per 20 AP. 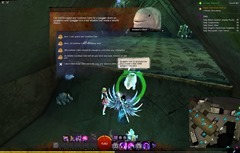 You have just 21 days for 2018 version of SAB so you can complete this achievement twice at the most for 40 AP. See Daily achievements for help regarding the daily achievements. Complete the race event in the Super Adventure Box lobby in under 5 minutes. The race starts at the opposite end of the lobby from the entrance and involves quite a bit of jumping. The second part of the race convert you to a bumble bee and you will fly around instead of jumping. The time limit is fairly tight so you may need to do some practice runs to get this achievement. It seems you can remain in bumble bee form and start it in that form for the next race. Not sure how much time it will shave but might be handy. Complete World 1 Zone 1, 2, and 3 in Tribulation mode. Complete World 1 Zone 1, 2, and 3 in Normal mode. Complete World 1 Zone 1, 2, and 3 in Infantile mode. 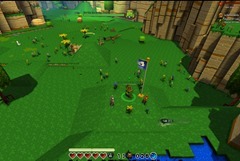 Complete World 2 Zone 1, 2, and 3 in Tribulation mode. 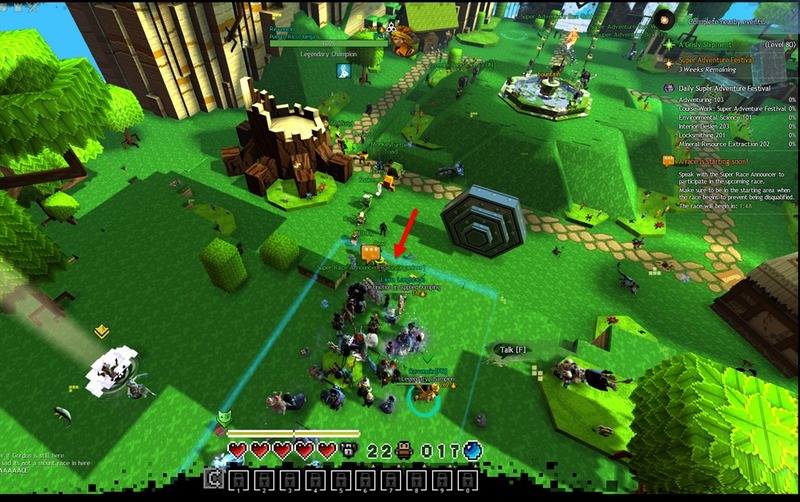 Complete World 2 Zone 1, 2, and 3 in Normal mode. 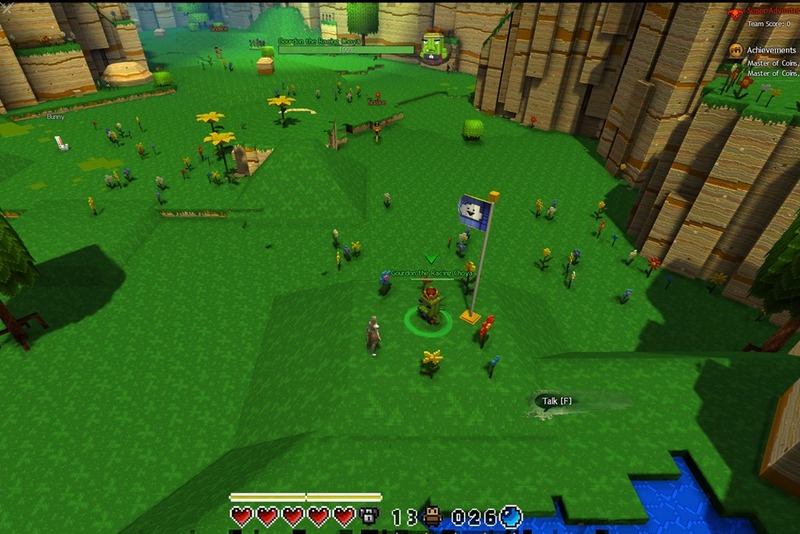 Complete World 2 Zone 1, 2, and 3 in Infantile mode. Will you add new adventures to collect coins too? “Slide down the Rata Sum cube.” Could you be a little more specific? The whole map is cubes. Literally just fall off the place, or down the chasms in the bottom. where are the choyas plz ? Is there a new infusion? Did they not add a race around Rata Sum like they showed us in the trailer? I haven’t seen one yet.